The Suffolk County Athletic Trainers Association is proud to announce the second annual scholarship funded by our organization to be awarded for the 2018-2019 school year. We will be awarding up to three $1000 scholarships to qualified graduating high school seniors who wish to pursue an education in athletic training at the college level. The SCATA scholarship committee will decide the final winners by May 15, 2019 and their guidance counselors will be notified. Below is the application and instructions for submission. The final due date for submission is May 1st, 2019. 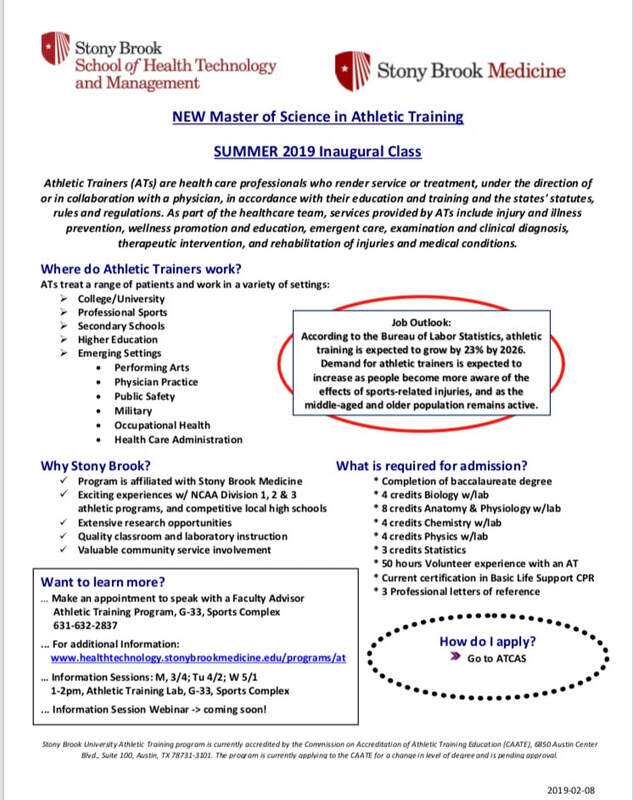 ​Congrats to Stony Brook University Athletic Training on officially implementing their Masters of Science in Athletic Training Program!! Set to begin their inaugural class Summer 2019! Below you can find more information on the program and how to apply. Please share!! The Suffolk County Athletic Trainers' Association is an organization of Certified Athletic Trainers and allied healthcare practitioners and professionals that promote the awareness and importance of the athletic training profession in Suffolk County, New York. The integration of diverse clinical practices and our steadfast drive for professional development exemplifies our commitment to provide the highest standards in the field of athletic training.